A hand coloured aquatint by John Clark after the painting by Joseph Francis Gilbert and published in Chichester in 1831. This evocative scene captures the moment when Priam won the Gold Cup, an achievement that he was to repeat the following year in 1832. 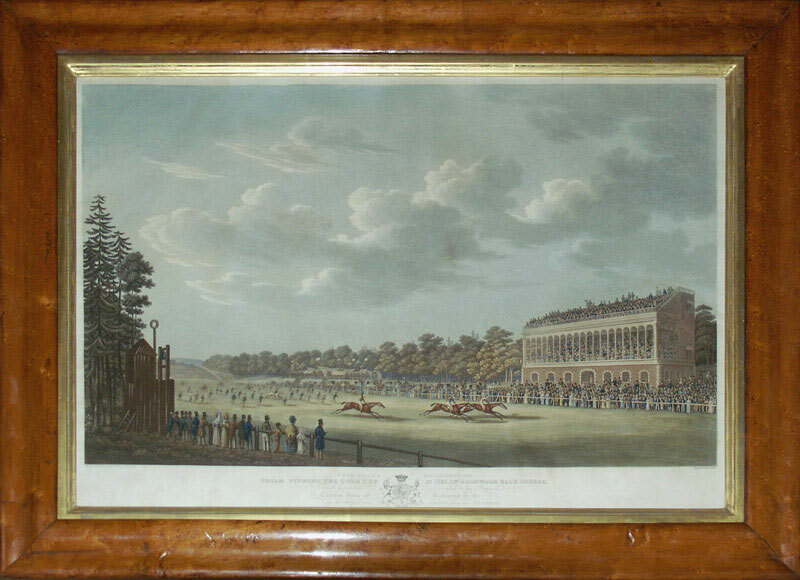 The Gold Cup was first awarded at Goodwood in 1812 and the racecourse remained immensely popular throughout the nineteenth century. John Clark appears to have had a productive but somewhat low key career and surprisingly little is known about his personal life. He certainly produced a large number of sporting and topographical aquatints after his contemporaries but opinion is divided as to whether he also signed himself ‘I Clark’ or whether these prints were the work of somebody else. Stylistically it would appear to be one hand at work suggesting that he was one of the most successful aquatint engravers of his generation.